Analog recording (Greek, ana is "according to" and logos "relationship," "word") is a technique used for the recording of analog signals which, among many possibilities, allows analog audio and analog video for later playback. Analog audio recording began with mechanical systems such as the phonautograph and phonograph. Later, electronic techniques such as wire recording and tape recorder were developed. Analog recording methods store signals as a continuous signal in or on the media. The signal may be stored as a physical texture on a phonograph record, or a fluctuation in the field strength of a magnetic recording. This is different from digital recording where digital signals are quantized and represented as discrete numbers. The phonautograph is the earliest known device for recording sound. The phonograph was the first machine used to capture and reproduce analog sound, and was invented by the well-known inventor Thomas Edison in 1877. 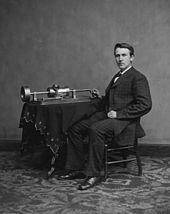 Edison incorporated various elements into his Phonograph that would become staples that can be found in recording devices to this day. For a sound to be recorded by the Phonograph, it has to go through three distinct steps. First, the sound enters a cone-shaped component of the device, called the microphone diaphragm. That sound causes the microphone diaphragm, which is connected to a small metal needle, to vibrate. The needle then vibrates in the same way, causing its sharp tip to etch a distinctive groove into a cylinder, which was made out of tinfoil. In order to playback the sound recorded on one of the tinfoil cylinders, the recording process is essentially reversed. As the cylinder spins, the needle follows the groove created by the previous recording session. This causes the needle to vibrate, and then the diaphragm. This vibration comes out of the diaphragm, which is now functioning as a sort of sound amplification device, much like the bell on any wind instrument. The result is an audible reproduction of the originally recorded sound. Edison's phonograph was the first of its kind, but drawbacks were nevertheless obvious. The biggest of these, and the one that ended up being fixed first, came from the physical contact between the phonograph needle and the tinfoil diaphragm. Because the needle had to continually make contact with the groove in the diaphragm every time the recording was played, the groove would wear down. This meant that every single time a recording was played, it was one step closer to being gone forever. Another problem with the phonograph was the permanence of its recordings. Unlike music today, which can be edited endlessly, the music captured by phonograph machines were single-take, live recordings. The last problem with the phonograph was related to fidelity. Fidelity is the similarity/difference between the original recorded sound, and that same sound after it has been reproduced by a playback device, in this case the phonograph. As can be expected from such an early audio recording machine, the fidelity of Edison's phonograph was extremely low. This lack of sound quality is why the phonograph was originally used to record speeches, meetings, and telephone calls, rather than music. Fans of modern record players are already familiar with one very early improvement on the phonograph, known as the gramophone. Inventor Emile Berliner created the device in 1887, only ten years after Edison's original device. Berliner's main improvement to the phonograph was related to the component of the device that actually held the recorded information. The previously used tinfoil cylinders were awkwardly shaped, making them hard to store. They could also not be reproduced economically, which was another reason why they were not seen as a viable option for recorded music. Berliner realized these disadvantages, and set out to create a better version of the tinfoil cylinder. What he came up with was not a cylinder at all, but was rather a flat circular disc much like modern vinyl records. These discs could not only be easily stacked and stored for safe-keeping, but were also comparatively easy to reproduce. This quality allowed for the mass production of recorded discs, which was the first step towards commercially recorded music. Unfortunately, though the Gramophone was a large step up from the Phonograph commercially, it still had many of the same problems. The mass production possibilities created by Berliner’s flat discs got companies thinking about recording music, but since nothing had been done to address the low fidelity issue, the industry had yet to really take off. The problems with finality and breakdown of recordings started by the Phonograph were equally as prominent with the Gramophone. The next great advancement in analog sound recording came in the form of the telegraphone, which was created by Danish inventor Valdemar Poulsen between 1898 and 1900. This machine was vastly different from the gramophone or the phonograph, in that instead of recording sound mechanically, it recorded using a process called electromagnetism. Poulsen was able to transmit an electrical signal, much like the one that would broadcast over the radio or a telephone, and then capture it on a magnetizable element, in this case a length of steel wire, which was wrapped around a bass drum. Poulsen's telegraphone was not without its share of problems. First, the reels of steel wire were extremely heavy, weighing approximately 40 pounds (18 kg) each. Secondly, steel's scarcity at the time raised the price of recording; a single minute of recording would cost a full dollar, and the price was further increased because multiple recordings were necessary in order to capture the best rendition. Moreover, steel wire could be dangerous, with a risk comparable to that of a bandsaw. Like the recording devices that came before it, the telegraphone recordings were nearly impossible to edit. Rather than cutting and splicing together multiple takes, as could easily be done with scissors or a computer in future recording devices, this machine required both a welding torch and a soldering tool to modify. In 1935, inventor Fritz Pfleumer took the electromagnetic recording idea and took it to the next level. Rather than using heavy, expensive, and dangerous steel wire like Poulsen, Pfleumer realized that he could coat normal strips of paper with tiny particles of iron. The iron would allow the paper to be magnetized in the same way as the steel wire, but would eliminate most of its shortcomings. The magnetophon operated with a process nearly identical to that of the telegraphone. An inscriber, called the recording head, passes over the electromagnetic paper strip, creating patterns of varying magnetic polarity within it, which can later be played back. The playback is achieved using a reversal of the recording process. The pre-magnetized paper, which had come to be known as tape, passed over a coil, creating changes in magnetic flux. These changes were translated into an electric current, which when amplified produced a replica of the previously recorded sounds. There were many advantages of tape recording, but the most important was that it led to the development of multitracking. Multitracking occurs when multiple takes of a performance, which were recorded at separate times, are brought together to play simultaneously. This is the method all recording studios use to this day, in order to record all of the separate instruments of a song, and get the best possible takes from all of the musicians. 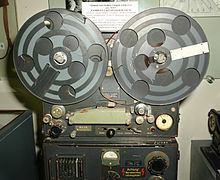 A reel of tape could also hold far more recorded information than previous mediums. For instance, Berliner's discs held only a few minutes of recording, meaning that each disc usually contained a single song, or multiple short clips. Pfleumer's tape reels, on the other hand, could hold up to thirty minutes of sound. This ability is what eventually led to the concept of a music "album", or collection of multiple songs. The original magnetophon had its share of setbacks as well. Namely, the problem of low fidelity found in previous devices had yet to be solved. Though audiences and inventors had not yet experienced what high fidelity recording would even sound like, they knew that the sound they were hearing from recordings needed to be improved before any kind of recorded music industry could be expected. The introduction of tape bias to recording systems improved fidelity to acceptable and eventually high-fidelity performance. Adding a DC bias to the signal sent to the recording head reduced distortion in the recording. The use of an AC bias further reduced distortion and greatly improved the frequency response of recording systems. ^ Brain, Marshall (2000-04-01). "How Analog and Digital Recording Works". howstuffworks.com. Retrieved 2013-08-05. ^ a b c d e f g h i j k l m n o p q r s Milner 2009, pp. 1-416. ^ "First Phonographs and Graphophones, and then Gramophones". Archived from the original on 2013-04-19. Retrieved 2013-08-05. ^ "Recording History". Archived from the original on 2013-07-15. Retrieved 2013-08-05. ^ "Inventing the Wire Recorder". Archived from the original on 2013-05-14. Retrieved 2013-08-05.